Dunlap Woodcrafts moved to our present location in Chantilly, VA.
an docile during the making of the rifle. We grade our stocks based on the figure they offer and how figure/curl behaves. check and recheck the grade every time we get to handle a gunstock. provided with a thickness between 2 3/8″ and 2 1/2″. 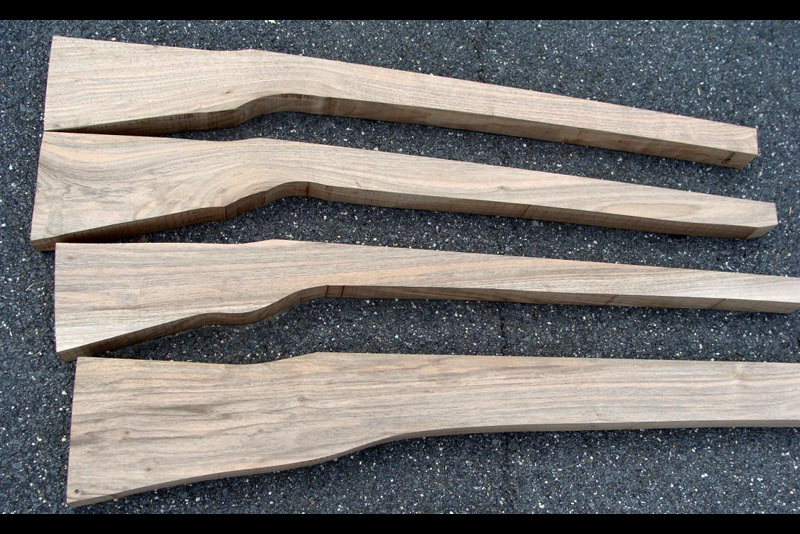 We try to maintain a constant supply of true English walnut gunstocks in different grades. we can also provide half-stocks for single and double barrel shotguns and modern gunstocks in different thickness. Fancy pistol stocks available too, please inquire with your needs. We price English walnut based on what it offers. Note, the nature of English walnut is to have sapwood in abundance. Stock blanks are available. Each stock is priced individually according to its own qualities. Due to the nature of heavy sap wood found in English walnut stocks. 1. All of the above stocks are kiln-dried to between 6 and 8 percent moisture content. 2. For maple stocks, Sugar Maple will be provided upon request when available. 3. Inquire for prices and availability of English and West coast Walnut. material. All fullstock pistol blanks will take a minimum of 10 inch barrels unless otherwise requested. 1. 25% discount for any three or more rifle blanks bought on the same order. EXCLUDES: English walnut stocks and pistol blanks. 2. Extra thick and extra long blanks (for 47″ barrel in length or longer) are an additional 20%. 3. We ship via Fedex Ground. Shipping and handling: $30.00 – $35.00 for one stock. Two or more please inquire.